Did you know? Up until now, Ontario chicken farmers had only two options: either buy an average $1.75 million quota (i.e. some sort of license) for the right to produce a minimum of 90,000 birds a year… or buy no quota and produce a maximum of 300 birds a year that they could only sell at their farm gate. No wonder Ontario alternatives to conventionally raised chicken are not available to our hospitals. It’s hardly available to anyone! Here is the good news: Chicken Farmers of Ontario (CFO) just announced a portfolio of new “flocking options” (600 to 3,000 birds) that will support expanded business opportunities for Ontario small and medium chicken farmers. Next stumbling block…. getting small abattoirs to process the chicken, since Ontario ones have all been closed down. In the sphere of urban farmers, the 5 south team would be called visionaries. 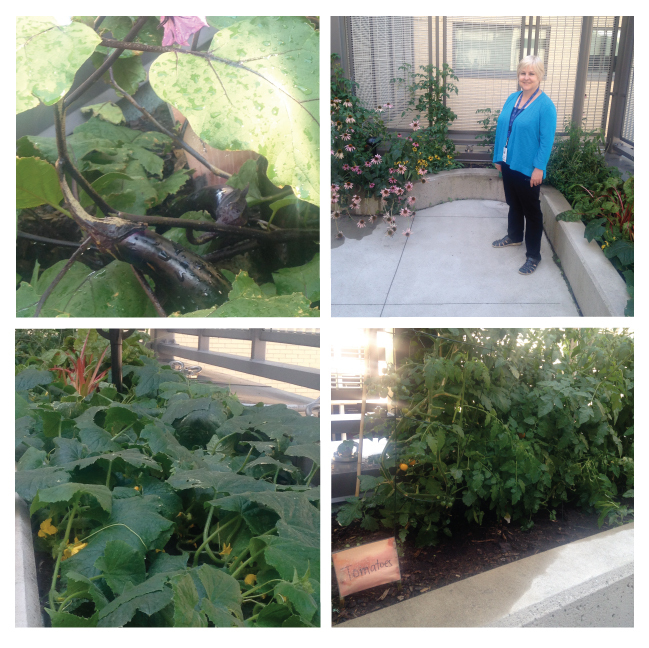 All around the world hospitals are reclaiming urban space to grow food. Urban farming is becoming kind of a big deal. In his book Food for City Building, Wayne Roberts – an internationally recognized analyst, advocate and practitioner in the field of city food policy – lists the benefits of urban farming: job creation, social cohesion, neighborhood revitalization. Healthcare professionals understand how the “feedback loop” (i.e., the time it takes to identify any positive outcome) of fresh food is very slow when it comes to health. Wayne Roberts defends that the feedback loop benefits cities quite directly: “More local sustainable food means more green spaces, more places to put compost and reduce cost of waste handling, more places to soak up rain and save on sewage main expansion, and so on”. This garden is a bit more established. It has been around for a while and the group of staff and patient volunteers has been playing with different seeds every year. 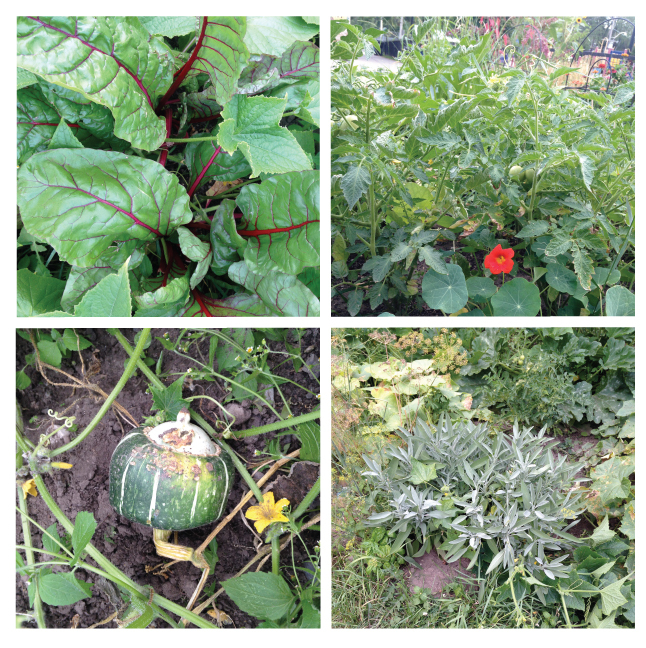 In the pictures you can see chard (top left), cherry tomatoes and their flower companion Nasturtium (top right), Buttercup squash (I had to look that one up) and sage (bottom right). We also have peas, cucumbers, kale, zucchini and other herbs. To join the Real Food Garden’s team of volunteers, sign up here. If this story makes you want to hug a farmer, you should check out the farmers’ market at the University entrance of Sick Kids, every Tuesday 8am-2pm. Better yet, join their newsletter and never miss a market day. This entry was posted in Beyond Talkin' Trash, Choices for Ontario Food project and tagged green team, local food, UHN Real Food Garden. Bookmark the permalink.